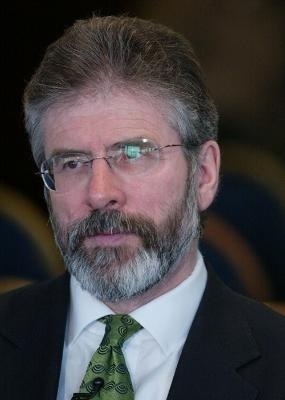 The following is an extract from the Leargas blog by Sinn Fein President Gerry Adams. It’s 1 o’clock on Wednesday morning. At Hillsborough. Sinn Fein has just concluded our discussions with the DUP. A week is a long time in politics. This week, and a wee bit more, has been a long time coming. Last year Martin McGuinness pointed out what no one in high places in London and Dublin would acknowledge publicly or tackle privately. That is that the political institutions were not sustainable in the longer term because they were not functioning on the basis of equality and partnership. In particular he said that the refusal to agree the transfer of policing and justice powers by Christmas would mean that they would not be transferred before the Westminster elections. This Blog told the British Secretary of State over twelve months ago that the political process was heading into huge difficulties not least because he had not discouraged the notion that pre conditions could be introduced into the transfer or devolution issue. In fact the NIO had actively encouraged that notion. Last Autumn Martin once again privately exhorted both governments to be more actively involved in upholding the Saint Andrew’s Agreement and just before Christmas and during the big freeze he made the long journey to the Taoiseach’s home town in Tullamore to ask him to engage directly with Gordon Brown. Our strong view was that the governments were in default of their obligations as guarantors of the Good Friday and the Saint Andrew’s Agreements. London and Dublin are not facilitators. Their function is not to ‘close the gap between the parties’. Their duty is to uphold the agreements and to hold the parties to what they had signed up to. They could hardly do that when they were not upholding the agreements themselves. We knew that the governments would intervene at some point if the problems were not resolved. But we were not prepared to have them intervene on terms set by London or by the NIO acting in what they perceived to be the best interests of the unionists. We decided that we would not travel to Downing Street if we were invited there as the crisis deepened. We also decided that our engagement would be guided by whether the modalities for talks and the agendas would be about assisting the necessary work of implementing the Agreements and resolving outstanding issues. So it came to be. Directly after the recent Sinn Fein Ard Chomhairle meeting Martin was invited to Downing Street. He said no. Despite a number of direct appeals by Brian Cowen and Gordon Brown we made it clear that Sinn Fein was not for travelling. The governments needed to talk to those who were in default. Sinn Fein needed to be satisfied that talks would be meaningful, and about upholding the rights of citizens without preconditions. We continued with that very reasonable position when the Taoiseach and the Prime Minster arrived at Hillsborough. Sinn Fein is used to negotiations being us against the rest. Unionism has the British government to negotiate for them even though the DUP probably distrust the Brits even more than the rest of us. We took steps to compensate for this. The consequences are too serious to allow a bad deal or no deal. Our objective was to succeed. Failure was not an option. As Sammy Wilson put it we needed a deal ‘Made in Ulster’. The citizens of Donegal, Cavan and Monaghan, will be pleased about that. But such a deal could only be accomplished by the leaders of unionism working genuinely to secure a new beginning which would see the proper functioning of joined up government based on equality and citizens rights. So Sinn Fein refused to let the governments facilitate talks or create the agenda for talks between us and the DUP. We needed to do that ourselves. Most of Sinn Fein’s 120 hours, last week, plus more this week, of negotiations were about keeping the NIO from messing things up, about neutralising unhelpful interventions from the governments, getting rid of pre conditions and creating the space for positive discussions between ourselves and the DUP. The mood at these engagements depended on who was there. Eventually we settled into focussed talks with the DUP leaders and proceeded to deal with issues of importance to each other in a constructive way. This shows what is possible. That was last week and Monday morning of this week. Then Peter Robinson brought the outcome of those discussions to his Assembly group and recommended that they accept what he agreed with us. It was put to a vote which he won by 22 to 14. There then followed what appears to have been a very heated debate. Martin McGuinness and I brought the same proposals to our group. We were to meet Peter Robinson when his group meeting was finished but he headed off to talk to the British. There was then a real concern that there would be an attempt to re-negotiate what had been agreed. We ruled that out. It is obvious that Peter has to go back to his Assembly group. We have just concluded our discussions with them. Martin McGuinness has impressed everyone with his leadership, patience and courage. I have no doubt that Peter Robinson will win the support of his group. Of course I could be wrong. He who hesitates is lost and all that. But let us be clear about this. At the first meeting a majority of the group supported him. Of course he has the right to manage his own party and he obviously needed a wee bit of space to do that. But once they come across the line everyone must move forward on the basis agreed at Hillsborough. The leaders who do this deserve our support. I have spent a lot of time here in Hillsborough this last ten years or so. David Trimble and I used to meet here privately for one to one discussions. Hillsborough is where we first shook hands. Mo Mowlam and I used to walk the grounds regularly as we discussed pressing issues. The staff in this place are very welcoming and professional, even when scores of politicians descend on them for days and nights on end without much notice. There have been no political parties here this last few days or nights, except us, the DUP and the 2 Governments. The deprivations of this last week or so and all the other inconveniences like sleeping on the floor, which accompany such negotiations, are a small price to pay for getting it right. Well done to everyone involved. No one should think that everything is going to be perfectly hunky dory from here on if the DUP sign up to this agreement. On the contrary the process of change will continue to challenge everyone. It is also a journey. This week’s work has prepared the ground for the next phase. It is all about advancing the rights of citizens. That is a continuous process. This agreement is a staging post. Monday was La Feile Brid- Saint Brigid’s Day. The Celts saw it as the first day of spring, a new season of promise and growth. Let’s hope they were right. Let’s face into all of this with confidence in ourselves and in the future.